The Judiciary Committee chair worries that a "dysfunctional" Congress won't press for needed drug reforms. It's easy both to understate and overstate the significance of the Justice Department's announcement Thursday that it would not immediately challenge new regulations in Colorado and Washington that aim to legalize and tax the sale and recreational use of marijuana. It's a bigger deal than you might think because the feds forewent litigation they surely would have won to block those voter-endorsed state initiatives. As a matter of constitutional law, the Obama Administration was (and still is) within its rights to argue that these state laws are preempted by federal law and policy. But last week's announcement is not nearly as big a deal as it could have been had the Obama Administration answered the many vital legal and political questions that still remain about marijuana's quickening march toward respectability. All we know today that we didn't know a week from today is that there will be no immediate litigation -- that the Obama Administration is content, at least for now, to allow Colorado and Washington to come up with a way to safety regulate pot like alcohol and tobacco. Unfortunately, the feds didn't even try to resolve the pot debate. They just agreed to let it unfold a little longer. So many questions remain -- for example, about the capital and credit that any industry needs to thrive. The Justice Department did nothing last week to offer any clarity to honest entrepreneurs in the burgeoning legal marijuana industry who are vexed by regulations that forbid banks from loaning money for ventures considered illegal under federal law. "Bankers are concerned they could be seen as having laundered money, aiding and abetting a crime," Rep. Ed Perlmutter told Fox31 Denver last week. "Many financial institutions won't provide financial services; consequently, it becomes an all-cash business. And when it's all case, you're subject to more robberies ..."
Nor did the White House announce last week in its "Guidance Regarding Marijuana Enforcement" that it has asked officials of the Drug Enforcement Administration to undertake a new review of marijuana's classification as a Schedule 1 drug, without any medicinal value, on a par with heroin, under the Controlled Substances Act. That classification, which flies in the face of nearly two dozen state medical-marijuana laws around the country, is the backbone of the executive branch's policy on pot. "Congress has determined that marijuana is a dangerous drug," Deputy Attorney General James Cole reminded his line prosecutors. Even as he pulled back on their reins, he told federal lawyers there were still plenty of reasons to prosecute under federal pot laws. In other words, the executive branch is only willing to go so far so fast in adjusting the nation's policy toward marijuana. On the federal level, it is clear, lasting reform will have to come from Congress. That's why Perlmutter has introduced a Marijuana Businesses Access to Banking Act, as capitalist a piece of legislation as you'll find anywhere. And it's why there is bipartisan support for Respect State Marijuana Laws Act of 2013, which would get around pot's draconian classification in the Controlled Substances Act by exempting from its federal definition those who are acting in compliance with state laws. The White House, and the Justice Department, clearly want Congress to lead, not just with marijuana reform but with the related (and broader) goal of sentencing reform. The big news from Attorney General Eric Holder last month was not his willingness to allow lawmakers in Denver and Olympia to take a clear shot at pot regulation but rather his decision earlier in the month to re-prioritize federal prosecutorial discretion over drug cases in general. Holder knows, and Congress knows that Holder knows, that any attempt to meaningfully reduce the number of non-violent federal prisoners also must include changing the text of statutes that define and classify marijuana. With that in mind, I spoke last week via telephone with Senator Patrick Leahy, the Vermont Democrat who is chairman of the Senate Judiciary Committee. Leahy, a former prosecutor, has consistently supported a more rational approach to the nation's costly and failed war on drugs. For example, along with Senator Rand Paul, a Kentucky Republican, Leahy this spring sponsored the Justice Safety Valve Act, which would formally return to judges more discretion to give sentences below the "mandatory minimums" that now apply. It's a measure that would memorialize in the text of federal law the new sentencing policy the Obama Administration announced last month. Indeed, even before the Justice Department announcement last week about marijuana, Sen. Leahy had scheduled a Judiciary Committee hearing, titled "Conflicts between State and Federal Marijuana Laws," for Tuesday, September 10. It will be a timely and important hearing designed both to press the administration for answers and to prod lawmakers to action. Here is the interview, minimally edited for space, which took place before the administration announced its policy of watch-and-see over state legalization efforts. There are now 20 states that have legalized medical marijuana in one form or another, and measures are pending in four other states. More than half of the nation's population lives in jurisdictions where medical marijuana is legal. Why are Congress and the White House so far behind the curve on this? Why isn't the federal government at least taking a neutral position? I've long urged the federal government to stay away from states where they have legalized the use of marijuana, or legalized medical marijuana, and the reason I am holding my hearings is to get a very clear understanding of what they want to do. We only have so many resources for law enforcement and to waste time on these minor marijuana measures or waste time on marijuana in states where it is legal makes absolutely no sense. 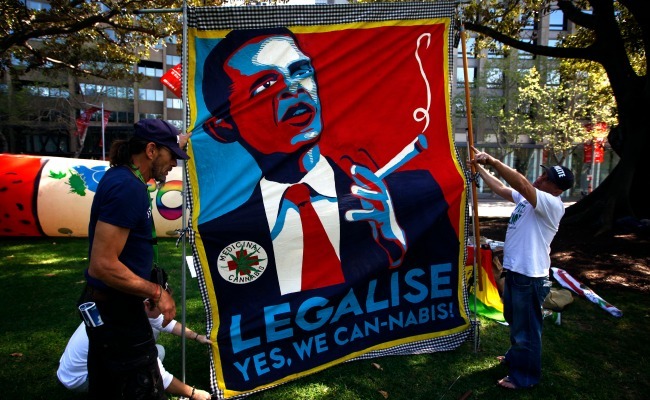 The basis of the executive branch's policy is marijuana's classification as a Schedule 1 drug. Can Congress push the DEA to reclassify the drug to account for its medicinal uses? Should Congress do that? And can Congress amend the Controlled Substances Act so that there is less federal power to arrest and implicate and indict in this area? Congress could change it, but as dysfunctional as some parts of Congress have been in the past couple of years I don't have as much hope for that as I do for an executive policy that does it. It can be done by executive policy -- just as every prosecutor has to determine what are the priorities. I spent eight years as a prosecutor. We did not begin to have the resources to prosecute every single law on the books. We had to pick and choose those that made the most sense. Certainly go after an armed robber or violent crime before you might go after some minor drug case. And most people understand that. Especially when you have a state that has made a decision to legalize. On a substance especially like marijuana -- the state's wishes should be acknowledged. What the White House and Justice Department say is, "Look, the DEA is telling us it has no medicinal value, it's a Class 1 substance." Can Congress push the executive branch to do more to update the status of the classification? Well, Congress, of course, can change the classification. My question is whether in the amount of time with the budget issues coming up, appropriations issues coming up, immigration and others, whether Congress would take that on. If they would I'd be delighted. That would be the best way to do it because it would involve not only this administration but the next administration three and a half years from now. That's the ideal way. In the meantime, though, the DEA and the Justice Department can determine which priorities they have and say that one priority is not to involve themselves in marijuana in states where they have legalized it. That they will not try to trump states on this issue. You've asked the attorney general to come explain administration policy with respect to state initiatives that seek to legalize, regulate and tax marijuana. What do you hope the he is going to say? I hope the attorney general says that it should be a state matter; that we have more important things to do. What can you do, what are you prepared to do, if the Justice Department allows these states to proceed right up until the date of the first legal sales and then moves in and arrests and indicts folks. Have you thought about that scenario? I think that would be a bad mistake. And I think that would probably be enough to get a number of members of Congress, from both the right and the left, to say, "We have more important things to do. Let's change the law." When the attorney general announced his sentencing reforms a couple of weeks ago you were quick to praise them. Do you see a link between those efforts from the Justice Department and the marijuana area? This is a related area, if the attorney general and the Obama Administration are serious about reform and cutting down costs. Do you see this being a part of that? I know that the attorney general is serious and I am hoping that these hearings press him to go even further.